When I was beginning my yogic journey, a rockstar in the LA yoga world Megan Bello gave me the best advice I have ever received: to find someone in the yoga world that you admire, take their classes, find out where they are giving trainings or were trained, gather inspiration, and complete your 200 hour. This is essential. Until you’ve taken the necessary steps for success you will never be able to see where the journey will take you. If you don’t have your 200 hr training yet, make that happen first. If you do, then find a mentor who you admire and allow them to help you cultivate a personal style. From here, begin teaching whenever and wherever you can! After you acquire your 200 hour and find a mentor, there are some nitty gritty details that can’t be overlooked. This first action you must take is registering with Yoga Alliance. This will allow studios and potential students to see that you have been trained through a registered and official school, and you will get several member perks! One of the member perks that you must use is discounted insurance. This will protect you from sticky situations and also help you build a reputation of professionalism. The yoga market is saturated right now, and while that is wonderful for the spiritual and yogic movement, it makes it harder to differentiate yourself. My advice to you is to find your niche and begin creating your own personal brand. There are so many variations of ‘yoga’ and I would encourage you to pick one outlet that inspires and speaks to you and make that your “thing.” This could be a heated Vinyasa, kid’s yoga, trauma sensitive yoga, or traditional ashtanga. Whatever it is, go all in and begin creating a consistent brand across multiple platforms. Choose a name and logo and use it on social media, websites, business cards, and even on your Yoga Alliance profile! Instagram is a platform where yoga is thriving so I encourage you to jump in and be a part of the conversation. If you need help coming up with a logo and don’t want to pay a graphic designer, I would recommend trying CANVA . They make designing really simple for non-design oriented people. The best place to start is Instagram simply because that's where the majority of yogis are already swimming. 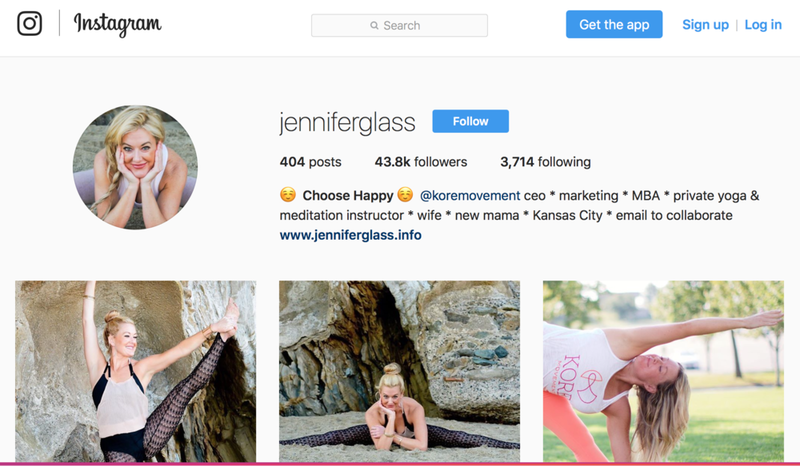 Oh so by the way follow me while you're at it :) @JenniferGlass On Instagram, use photos that represent truthfully who you are, your speciality and include short snippets of inspiration or information in the caption. Instagram is the best place to share your true and authentic self with your followers- so don’t be afraid to show your heart. If you feel comfortable adding other mediums, the next best place to be is Facebook. Facebook allows you to give larger pieces of information to your following. The most important thing to keep in mind here is the importance of not just copying over information- people will follow you on both platforms to gather NEW pieces of information. So with every platform you add, make sure you have the content to support it. Facebook is a great place to post snippets of blogs because you can click on links through Facebook that will re-direct people to your website or blog. Your main objective should be active engagement! If you feel overwhelmed by the idea of managing multiple social media platforms at once, try using a site like Buffer to help you schedule your posts ahead of time. You can do this one day a week so that all your posts for the upcoming week are done ahead of time, or even at the beginning of each month. The other important feature Buffer offers are analytics that give you insight to the best time of day to post so that you can reach the largest audience possible. Being aware of social media ‘best practices’ will help you manage your social media and build a strong follower base. The last step is to begin moving past manifesting the career of your dreams and begin taking action. Teach, maintain a consistent presence online, deliver content that inspires and reigns true to your authentic self, and create an impactful and intentional relationship with your clients. At the end of the day, you’re delivering a service to your followers, so try and put them first with each action you take. Ask for their feedback and use their critiques to better your practice and classes. This will take your following from being mere customers to being your personal brand advocates. To keep yourself organized, try and keep an updated list of emails, phone numbers, and relevant information about your followers and clients. This enables you to easily reach out when you have classes, trainings, or opportunities. Meaningful connections will lead to a meaningful network of people around you, so never underestimate the power of genuiene connections. Give your followers and students the tools to give testimonials and be a part of the conversation surrounding what you are doing. The last advice I would give you is to create a business card that includes your website, information, and social media handles. This will allow you to reach out to people and maintain a professional profile. Create FREE business cards on VistaPrint: their templates are clean and easy to use. What other ideas have worked for you? Please Share :)! !